If you think that making low FODMAP granola is difficult, think again! It takes less than 10 minutes to mix all of the ingredients and then it bakes for 25 minutes. Voila, crispy golden granola. Let’s just say, I’ve made my fair share of home made granola, but I keep coming back to the same main ingredients. Oats, walnuts and maple syrup. This one with orange zest is my absolute favourite! Crispy golden low FODMAP granola. In my opinion, walnuts are a superfood in disguise. Walnut oil is high in ALA (alpha-linolenic acid), a plant based omega-3 essential fatty acid. Walnuts are great source of protein. A quarter cup has 5 grams so they can help to keep you full. They are also low in FODMAPs. I love to add walnuts to my morning oatmeal, sprinkle them salads, and I even use ground walnuts to make a creamy tomato pasta sauce. Although granola can make a healthy breakfast, many store-bought granolas contain high FODMAP ingredients like honey, agave, cashews, inulin, chicory root, and others. They also may contain several foods that become high FODMAP in larger servings like flax, dried coconut, chia, almonds, sunflower seeds, or pumpkin seeds. According to the Monash University low FODMAP app, the portion size for whole and steel cut oats is 1/2 cup. Above that, oats become high in fructans. The same thing applies to my granola. The serving size is a 1/2 cup. If you are still not quite sure what a FODMAP is, there is a brief overview in a previous blog article as well as a great video clip from Monash. 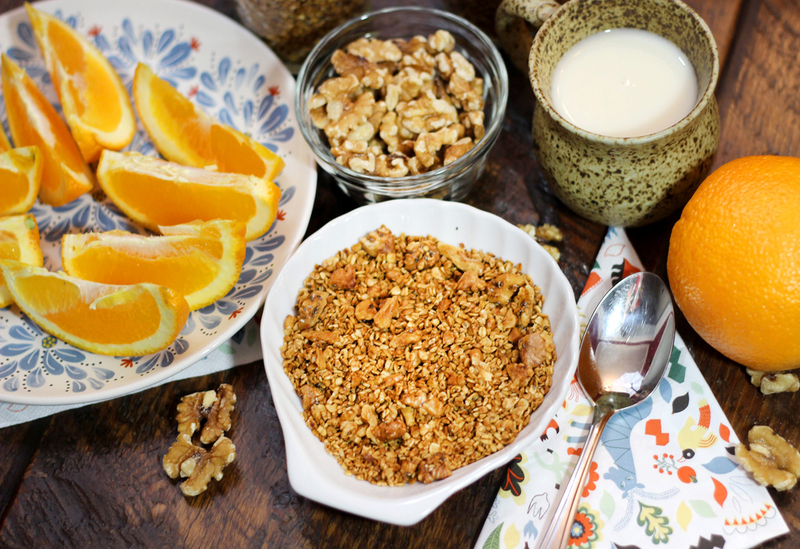 Enjoy a healthy breakfast of low FODMAP granola, lactose free milk or almond milk and an orange. This is an easy recipe to make with the ingredients in your pantry. Once mixed, it cooks in 25 minutes. Enjoy! Preheat oven to 350 F and line 2 large, rimmed baking sheets with parchment paper. In a small bowl, combine the orange zest and sugar (2tbsp). In a large mixing bowl, combine the oats (4 cups), walnuts (1.5 cup), cinnamon (1/2 tsp), salt (3/4 cup) and orange/sugar mixture. Pour in the coconut oil and maple syrup. Combine well. Spread the granola onto your prepared baking sheets. Bake for 25 minutes. Mix half way through. Serving size: one slightly overflowing ½ cup measure. I made this recipe when I was expecting a group of kids after school. With every new recipe, my family or anyone who is around, is asked to rate it out of ten. As you guessed, all of my son’s friends gave this recipe a perfect 10! One of the boys even asked for the recipe! This recipe makes 9 squares. The portion size is 1 piece or 1/9th of the recipe because granola, rice crispies, and peanut butter all become high FODMAP in larger portions. One square is just enough to fill you up, but it may be difficult to stop at just one. I suggest that slice the bars, take one for yourself, and put the rest in the cupboard. They go really well with a glass of lactose free milk. Enjoy them mindfully! Line the pan with parchment and lay a second piece on top. Flatten the bars with your hands and then refrigerate so they are easy to cut. A perfect high protein workout or after school snack. One last thing before you go. As you can tell, creating low FODMAP recipes can be tricky! I am very fortunate to work with a fellow Canadian FODMAP dietitian and friend, Lauren Renlund who reviewed this post for me. It is so important to have a second set of eyes to help review these blogs! 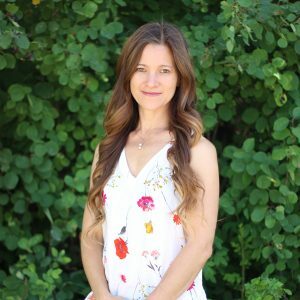 You should definitely check out Lauren’s low FODMAP blog. She has many simple and delicious recipes on her site! Heat the peanut butter (1/3 cup) and the syrup (1/2 cup) on medium in a medium sized pot. Stir continuously until they blend together. Remove the pot from the burner and add the Rice Crispies (2 cups) and granola (1 cup). Stir until they are combined. Spread out the granola. Cover it with another piece of parchment paper and compress it with your hands until the bars are firmly packed and flat on top. Place the pan into the freezer for 5-10 minutes to cool. This makes it easier to cut it into bars.